Back problems of all different varieties plague athletes of any age, but particularly those over the age of 40. A lack of ability to rotate hips, turn shoulders, or even bend over to pick up the golf ball can leave older players discouraged. Enter local fitness guru John Carrido — a fitness expert for more than 30 years — who knows the body. If he didn’t, he wouldn’t have won Mr. Orange County, Mr. California, and placed top-ten in the Mr. America competition in a four-year span. On top of that, he’s also a singledigit (3) handicap. Though 1986 is long behind Carrido, his knowledge of the human body in regards to the golf swing is overbounding. After obtaining his degree in Exercise Physiology from California State University - Long Beach, Carrido applied his knowledge to golf. 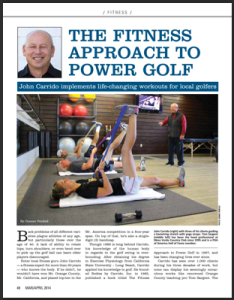 He founded Bodies by Carrido, Inc. in 1985, published a book titled The Fitness Approach to Power Golf in 1997, and has been changing lives ever since. As a professional golfer aspiring to play on the LPGA Tour, I realized a need to gain strength so I could create more club head speed, hold positions in my swing, and ultimately add some distance to my game. 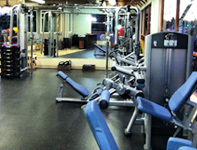 Almost every tour player is in the gym now, it is survival of the fittest out there. Since I’ve been working with John, I’ve become much more aware of what muscles and motions are important in my golf swing. I’ve also learned the importance of strength and flexibility combined. Read More.